Good news, Brickell drivers, pedestrians and Metro-mover riders: the cranes are gone from the Brickell City Centre construction site and key components will be up and running soon. “We are a fluid construction site, although we are very close to delivery of certain components,” said a spokesperson for Swire Properties, which is developing the massive project. All of the buildings in the first phase have been topped off. 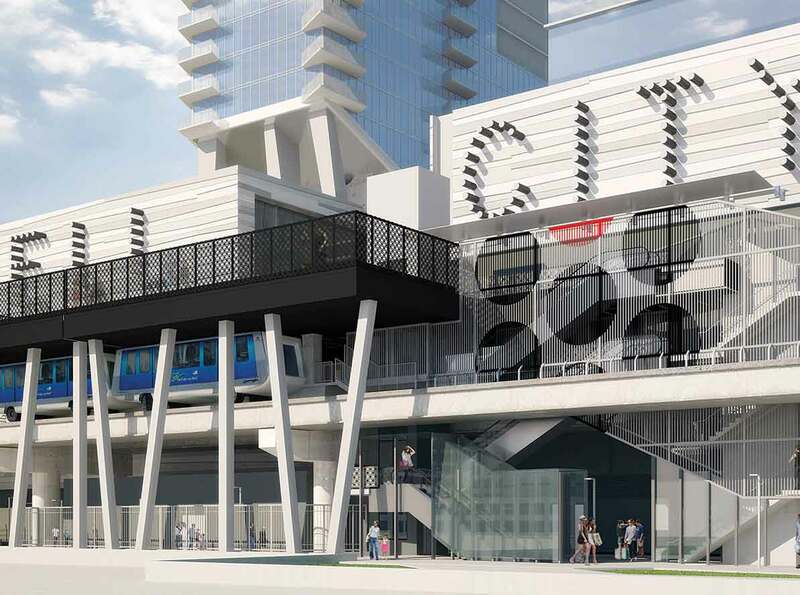 The Eighth Street Metro-mover station, closed since August 2014, will re-open this fall, revitalized and incorporated into a third level of shopping, she said. Riders will be able to disembark and get to the street level, she added, though the station will not be connected to the rest of the complex yet. The bulk of the first phase “is scheduled to be delivered this winter,” the spokesperson said. Included are two office towers (Two Brickell City Centre at 78 SE Seventh St., with 129,338 square feet of space, and Three Brickell City Centre, with 134,550 square feet of space at 98 SE Seventh St.), the 263-key Miami East Hotel at 788 Brickell Plaza, and three residential buildings. They are the East Residences, with 89 units at 89 SE Eighth St., the Rise Condo at 88 SW Seventh St., and the Reach Condo at 68 SE Sixth St., each of which will contain 390 units. A 500,000-square-foot shopping center at 701 S Miami Ave., to include food, beverage and entertainment, is scheduled for completion in fall 2016. Construction on Phase II, which comprises the 80-story One Brickell City Centre, is scheduled to begin at the end of 2017. North Squared at 529 S Miami Ave., on the Miami River, is slated for future development but a timetable has yet to be determined for it, the spokesperson said.